The Origins of Lady Liberty- Let’s Investigate! Reading through old papers and posts, I thought I should add the following article. I’m looking forward to yet another trip to my ‘home from home’ New York. After reading this article and gaining further information, I’ve seen the Statue of Liberty differently. For me, it has never represented ‘freedom’ and now I often wonder how the original lady would have impacted on New Yorkers back in the 1800s. The sculptor of the statue was a French-born Italian named Auguste Bartholdi. At the age of twenty-nine he visited Egypt and the sublime sculptural legacy of the Black Egyptians left an indelible mark on him. According to Graham Hancock and Robert Bauval, authors of Talisman: Sacred Cities, Secret Faith, it was during his visit to Egypt that Bartholdi met Ferdinand de Lesseps who was then planning to construct the Suez Canal to link the Mediterranean Sea with the Red Sea. 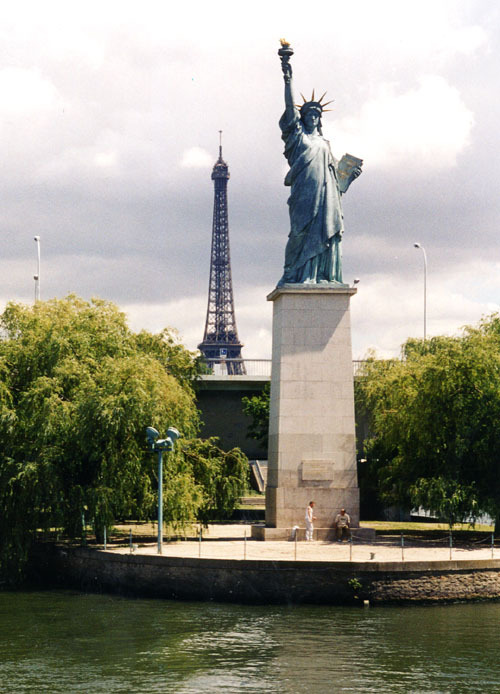 Impressed, Bartholdi thought of making “a gigantic statue of a goddess holding a torch.” This statue was to overlook the canal. However, his plans failed to materialize.Liberty: First Hundred Years, Bernard Weisberger claims that the giant statue was to be that of the Egyptian goddess Isis. It is a fact that Isis was Black, as was her husband, Osiris. This raises the interesting question:”Was the Statue of Liberty originally conceived to portray a Black woman as some Black historians like Leonard Jeffries (5) have asserted? Indeed, the Cult of Isis was quite strong in France. The Statue was the brainchild of the French historian and politician, Edouard de Laboulaye, who was also the Chairman of the French Anti-Slavery Society. The idea was to sculpt a monument in honor of Black soldiers who were instrumental in the defeat of the Confederacy during the Civil War and thereby ensuring the end of slavery. They mooted the idea to the French Government of presenting a statue to the United States on behalf of the French people through the American Abolitionist Society. Bartholdi used a Black woman as the model for the original statue, Isis, no doubt. The original model is said to be in France and is black. The American Committee of the Statue of Liberty did not approve of the idea, however, as the issue of slavery was still in favor by the Southern States despite their defeat in the Civil War. When he was first presented with the statue, the U.S. Minister to France claimed that the South might object to the broken shackles. Bartholdi completed the statue depicting a Black woman with a broken chain of slavery in her left hand and at her feet in 1870. The 151-foot statue was set up in New York Harbor in 1886. A 21-inch model can be found at the Museum of the City of New York at Fifth Avenue and 103rd Street. It was displayed at the Museum on February 9, 2000. The N.Y. Post also displayed the original dark face of the Statue of Liberty on June 17, 1986. Ultimately, the face of the Statue of Liberty was modeled after Bartholdi’s mother, Charlotte Beysser. The 151-foot statue was set up in New York Harbor in 1886. I heard or read something similar to this a while back, shocking! Genius Bartholdi, born at the right time with genius italian genes to boot.